In addition to some of the other awesome benefits, this gets you 2 free lounge visits a year! As part of a recent trip to see my sister get married, we spent some time in one of the airport lounges at the ATL airport. 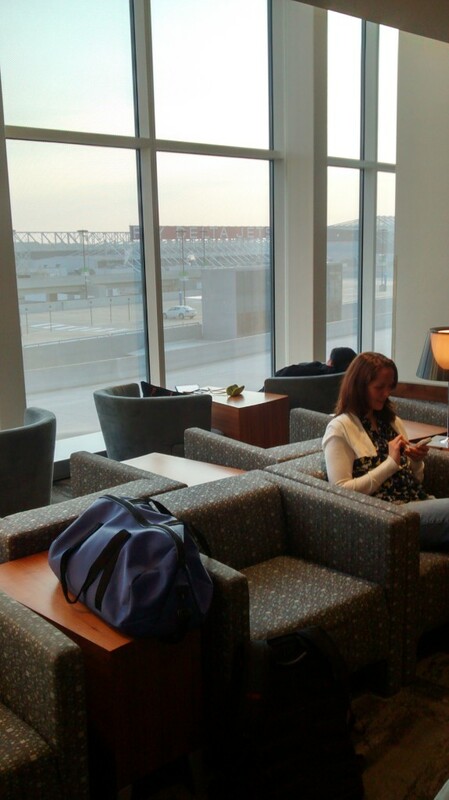 I wrote a few weeks ago about how you can get lounge access for free using the Chase Ink card. It’s not quite as easy as just showing your Ink card at the lounge, so if you’re interested, you’ll definitely want to read my post about how to get your Lounge Club access card. There are only 19 of these Lounge Club lounges in the United States (though there are a lot more internationally), but thankfully one of them is in Atlanta, where we were a few weeks ago. Our weekend trip in Georgia was good (although our flight being delayed by 4 hours wasn’t fun). The wedding was good, it was great to see family, and our stay at the Hampton Inn LaGrange was also very pleasant. I enjoyed the free breakfast on Saturday morning, but we had to leave pretty early on Sunday morning to get back to the airport. Our flight didn’t leave till 9:30, but my sister’s flight left about 8 a.m. and we had an hour drive back into Atlanta beforehand. After waiting with her at the US Airways departure gate for her flight back to Sacramento, we made our way on the “Plane Train” to Terminal F, the International Terminal in the Atlanta airport. Since we were (obviously) in the domestic terminal, I was unclear as to whether or not we would be able to get to the International Terminal or not on this side of security. It worked out just fine coming from the domestic terminal. The Club is open from 6 a.m. to 9:30 p.m., even on weekends. When we got in, we showed my lounge club card and the agent asked to see our boarding passes. I guess that’s to try and prevent people from doing something like the guy who rebooked his ticket 36 times to get into the Lufthansa lounge in Frankfurt. Having never been in an airport lounge before, I was not sure what to expect. It was an open room and there was plenty of seating. Early on a Sunday morning, there were not very many people in there. There were 2 shower rooms but we didn’t use them. The lounge had a view on one side of the airport and on the other side the security lines for the International terminal. We only had about an hour or so to kill, so we didn’t hang out there too long – just long enough to get a few things to eat, relax a bit, and then we made our way back to our gate for our departing flight back home. Thanks for taking a picture of me with my mouth full of Oreos!! All in all, I would say it was not particularly worth the $27 per person that it would typically cost for a day pass, but it was definitely worth the $Free that we spent on it! What about you? What are your favorite lounges? I was just at this lounge a couple weeks ago. I’m a little confused though. Is it always free to enter at that lounge? Or do you only get two free visits? No it isn’t always free. I think it is normally $27 / person to enter, which is WAY more than I’d pay. You can get 2 free visits if you have the Chase Ink card, which I talk about here.